The San Francisco 49ers fell three points short in Super Bowl XLVII, but a look at the boxscore reveals that the team did achieve a rare feat in their 34-31 defeat at the hands of the Baltimore Ravens. Quarterback Colin Kaepernick passed for 302 yards; running back Frank Gore had 110 yards rushing; and, receivers Michael Crabtree (109 yards) and Vernon Davis (104) each passed the 100-yard mark in receiving yards. This was the first time in Super Bowl history that a team that had a running back with 100-plus yards, a receiver with 100-plus yards, and a QB with 300-plus yards lost in the Super Bowl. This 100-100-300 trifecta had happened only twice before in the 47-year history of the Super Bowl: The Washington Redskins did it in 1988 with running back Timmy Smith, receiver Ricky Sanders and QB Doug Williams. The Denver Broncos did it in 1999 with running back Terrell Davis, receiver Rod Smith and QB John Elway. You will also notice that this was the second time in Super Bowl history that the team that lost had teammates both gain 100 or more yards receiving. The Cincinnati Bengals receiving duo of Cris Collingsworth and Dan Ross did it their 1982 loss to the San Francisco 49ers. Here’s a look at the runners with 100-plus yards, receivers with 100-plus yards, and QBs with 300-plus yards in a Super Bowl loss. Six players had at least one game with 100 or more yards rushing in an NFL playoff game last year. The six: Ray Rice, Bernard Pierce, Marshawn Lynch, Colin Kaepernick, Frank Gore and Arian Foster. Gore gained 100-plus yards in two playoff games, including the Super Bowl, in last year’s postseason. 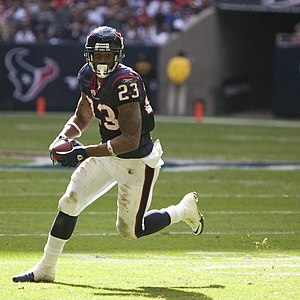 With his 140-yard effort versus Cincinnati on Wild Card weekend last postseason, Foster became the 18th player since 1960 to have three 100-yard games in his playoff career. Following are the players who have had 100 or more yards rushing in three or more NFL playoff games (since 1960). * There have been 124 different players who have gained 100 or more yards in at least one NFL playoff game. * There have been 207 times when a player has gained 100 or more yards rushing in a playoff game since 1960. Teams have won 167 and lost 40 (a .807 winning percentage) in those playoff games. * Eric Dickerson holds the playoff record with 248 yards gained in a postseason contest against the Dallas Cowboys on January 4, 1986. * Seven different players have gained 200 or more yards in a playoff game. * Michael Vick has the fewest carries to reach 100+ yards in a playoff game with eight. 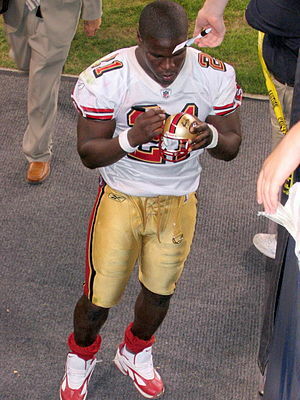 He did this with the Atlanta Falcons in a January 15, 2005 contest against the St. Louis Rams.